Don’t worry, we would never forget our awesome groom! I’m sure as soon as you popped the question to your now fiancé it’s been wedding planning all day, every day. We know it can be overwhelming especially when you’ve most likely never planned a large and extravagant event. I’m sure you’re realizing now that there’s a lot of detail involved and many planning stages as your fiancé has bombarded you with information! It’s certainly an exciting time so before you start getting a raging headache from trying to choose flowers, the venue, to your catering, you should check out our wedding planning timeline for the Groom 2.0 below. Weddings certainly are not the same as they were 30 years ago so that’s why we targeted this blog post to the modern 21st century groom to give you some general guidelines to stick to during the wedding planning. Okay guys, we know it’s a crazy time when you’re being dragged around to a million venues, florists and meeting with more DJs than you can count. However, it’s a great time for you to be going to these initial appointments. You won’t necessarily need to be involved at every meeting (unless you want to be!) with your vendors once they’ve been booked, but it’s a great learning experience for both you and your fiancé to meet with vendors initially. It’s nice to have second pair of eyes and ears listening in to all of the information because while us gals probably have our heads up in the clouds filled with excitement…that’s where you come in. We’re bound to miss something and that’s why we have our handsome knight next to us also trying to weed through all of the information. If you’re not into shopping, well this may be a hard step for you, but if your fiancé loves shopping, I definitely suggest bringing her along. 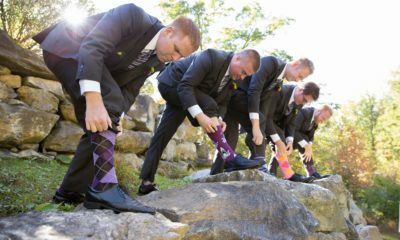 You’ll want to bring your groomsmen, father and future father in law as well on this shopping spree! I’m sure you and your fiancé have some general colors that you had in mind for your wedding day so you’re probably going to want to stick close to the color scheme you’re going with. There are so many suits and tuxedos to choose from so it’s a great idea to do some research (guys have Pinterest accounts too!). Look through different wedding day styles for men and try to narrow down 2-3 looks that interest you before heading to the store. It’s always good to pick something that the majority of everyone likes, but keep in mind you want to make sure you’re comfortable the day of, so as long as you’re comfortable, that’s all that really matters. This is a big one. Right before the wedding there are so many minute details that need to be settled before saying “I Do” and it can become especially stressful. There are a ton of moving parts and we’re sure your fiancé is in high stress mode as well. Just remember that this day is going to be one of the best days of your new life together. All of your family and friends are here to see you make a life-long commitment to one another. Something is bound to not go exactly the way you and your fiancé envisioned it, but keep in mind that at the end of the day you’ll be a husband and she’ll be a wife and you’ll be riding the roller coaster of life together.